Burlesque was very popular in the Victorian age. A form of feisty comic theatre, it took a well-known political or social event, story, opera or play and then went on to satirise it by means of puns and word play. 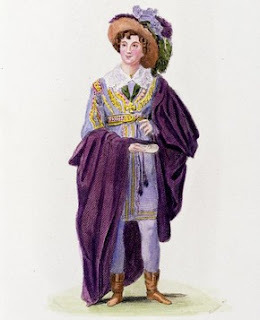 One of the earliest burlesque artistes who performed in the 1820’s (and whose legs when revealed were said to inspire many gentlemen to write poetry, and others to create pottery figurines that proved extremely popular) was the famed Eliza Vestris, originally an opera singer who progressed to dressing up as a man to send up classical arias. 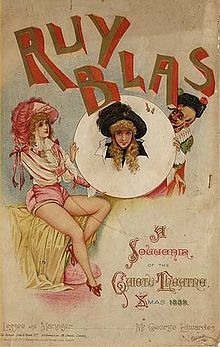 By the mid nineteenth century Burlesque acts were common in England with extravaganzas in music halls, or as part of the annual pantomime seasons where attractive women strutted the stage, posing as men while exposing their figures in - oh, so saucy - flesh-coloured tights which left little to the audience’s imagination. Such a tantalising vision was never permitted in normal life – at least not by those who were decent. 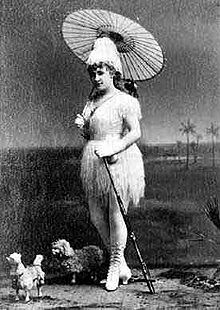 Lydia first took to the stage when she was only fourteen years old becoming a member of the corps de ballet at Her Majesty’s Theatre in London .Soon after that she was a star, playing the lead female role in many best-selling pantomimes. 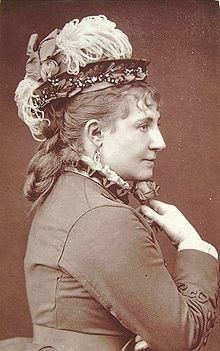 In 1863 she married and gave birth to a daughter, though sadly her husband was to die before their second anniversary after which Lydia continued to work, eventually marrying again – and this time to Alexander Henderson, the manager of Liverpool’s Prince of Wales Theatre. In 1868 he and Lydia set sail for America to present the British tradition of burlesque in the form of their 'Ixion' show which, that first year in New York alone, grossed a total of $370,000 - back then a quite enormous sum. 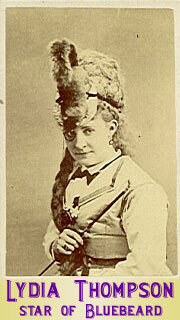 The new-fangled entertainment of Lydia's troupe of 'British Blondes' took America by storm, proving to be a potent lure and though her marriage did not survive she continued to manage the act, combining beautiful women with songs full of charm, wit and innuendo; all with clever local references which made the audience feel right at home. The ‘degrading and immoral’ content caused Lydia's name to be roundly damned from many a New York pulpit, but such an indignant reaction only helped to spread the word, providing great publicity with more and more punters eager to pay to see what all the fuss was about. 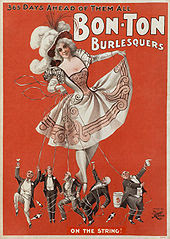 In due course there were several copy-cat shows which toured all over America, and many with women managers, although by the twentieth century Burlesque evolved into something else - the shows increasingly risqué, having less to do with the wit of the songs and more about titillating striptease - whereas for Lydia Thompson and her troupe of British girls, the stage costumes were archly suggestive rather than blatantly bawdy. Even so, coming at a time when most of the female population were confined in yards of fabric, the cross-dressing sexual allure of those women who walked on the stage as men must have sent out a powerful political message about independence and sexuality. Finally, for your delectation and delight, please see the slide shows posted below - and although the music that accompanies them is something you'd find in much later productions, please don't let that put you off. These images really are charming. Lovely post. As a pantomime and Music Hall enthusiast it's familiar territory to me. I did a lot of research on the Gaiety for a book - although I didn't need to, I just enjoyed it! Thank you Lesley -oh, the Gaiety material must be so fascinating - and fun! What an amazing lady and so beautiful too. The pictures are amazing! Thank you Kelly-Marie. I love these old photographs and newspaper cuttings. Gondal-girl, thank you! Lydia was reported to have said that she was driven to the horse-whipping by all of the falsely scandalous reports in the papers. Love her for it. As to Benhardt, goodness knows...but thereby might hang another post! The oriental burlesque theme is so exotic. I also think the horse-whipping must have been quite the thing for these 'gals' as I'm sure Lola Montez went in for it too when she was in San Francisco. "In 1863 she married and gave birth to a daughter, though sadly her husband was to die before their second anniversary after which Lydia continued to work...." This husband was John Christian Tilbury, son of John Tilbury, creator of the Tilbury gig. He died when his horse fell on him. My husband's great grandmother was Kate Tilbury, daughter of John Christian's brother Harry. Because of the family connection, we have been researching Lydia and her daughter Zeffie. Your post is very interesting thank you. That's fascinating, Cookiebiscuit. Good luck with your research. What a wonderful family connection.